Imitation is the sincerest form of flattery. eBay has quietly rolled out a new shopping experience called "Group Similar Listings" that unifies listings so shoppers can view an Amazon-styled product page instead of individual seller listings. eBay's focus on structured data is has allowed Group Similar Listings. 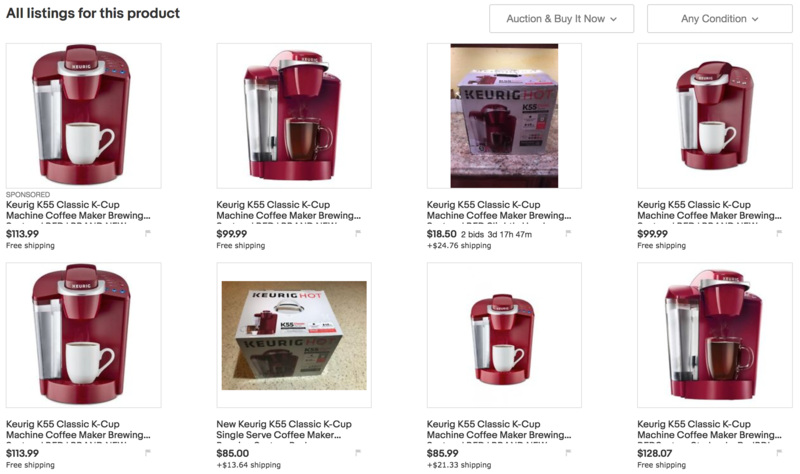 If sellers are listing products of the same UPC and Condition, eBay knows these products are identical and incorporates the highest ranked seller's product data (i.e. images) to accompany the "Our Pick" listing. This Group Similar view allows you to see eBay's "Our Pick" curated result as well as the "Brand new: lowest price" and "Pre-owned: lowest price" options. Below these prominently displayed options, you can see "All listings this product", a similar yet more visual shopping experience when compared to Amazon. Below these prominently displayed options, you can see "All listings this product". Overall, eBay's Group Similar Listings mode is a similar yet more visual shopping experience when compared to Amazon which we believe will help eBay defend and grow marketshare. The data points we're seeing tell us that seller performance, price and primary image quality are more important than ever. We believe eBay's selection algorithm picks the seller by weighing a combination of fulfillment performance and price competitiveness. If you're an eBay seller, we'd love to get your feedback!